League of Legends is a 5v5 team game. Yet the vast majority of games played are as a solo player, either in Normals or Soloque. In these modes the individual skill of the players in the game is by far the largest contributor to which team wins. The problem with this is it leaves players woefully unprepared for playing in the NUEL. Sure a lot of players play in ranked 5vs but not in anywhere near the same amounts. There are two key areas which are needed on top of individual skill when moving into organised play: strategy and teamwork. Now what is that I hear you say? True, that would help a bit. However there is a massive difference between watching something at the highest level of play and executing it successfully or understanding why it works. On top of that, while professional teams are supported by teams of analysts and coaches, the majority of NUEL teams don’t get that luxury. Fear not though. I am going to be writing a series of articles over the next few weeks with the aim of introducing the basic concepts behind strategy. *Most* of what I will be talking about you are likely to have some vague (or not so vague) idea of already, but my aim is to define everything more rigidly and draw all the various aspects together into one or more overarching theories. Remember: just because your opponents may be able to outplay you doesn’t stop you from outwitting them. Strategy is merely a means to an end, that end being victory. The most important thing to remember is that this is the primary goal of any strategy: to kill the opposing nexus. From that premise it is possible to work backwards when formulating strategies. 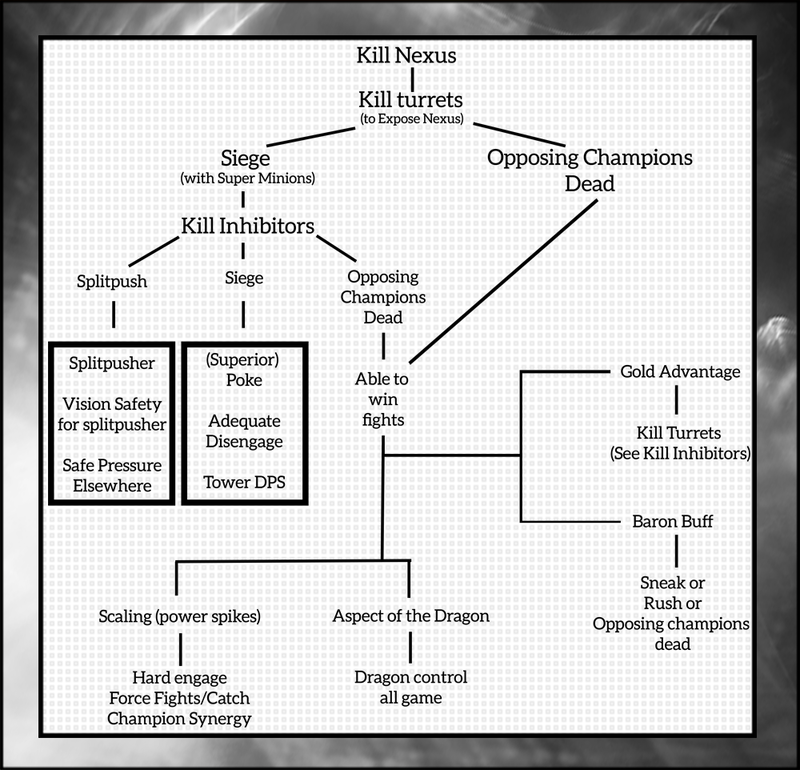 Here is a quick flowchart working down from the win condition to the steps required to reach it. When you consider strategies like this it is a good way of letting you form a game plan or composition. This flowchart is by no means complete or extensive but does show the majority of (strategic) routes to victory. The idea is that a flowchart like this is a good base to develop further understanding of strategy, I strongly encourage every team to have one similar to this but expanded. It can go into much further detail than I have, but going into further detail on it would take a whole other article of stating the mostly obvious. Before I go defining the different types of strategy it’s worth covering this. These are the different ways of incorporating strategy into a team. Every team composition a team picks will have innate strengths and weaknesses. It will lend itself well to some strategies but poorly to others. I refer to this as “Picks Strategy” or “Compositional Strategy”. For example Varus mid in basically any composition makes it into a poke/siege team, but if you play it and constantly teamfight without poking first you will lose out. This brings me nicely to “Playstyle”. This one is obvious, it is how you play. It is completely independant of the champion picks. You can try to siege with Fizz or teamfight with Shaco if you wanted to. But the important point is that both picks and playstyle support each other. If you pick an early pick-comp you need to play to reflect that. If your team naturally leans towards just forcing teamfights over and over again, you need to pick to reflect that. If you don’t and there is a discrepancy between your picks and playstyle you are at an instant disadvantage. There are loads of different strategies to play League of Legends but those aren’t what I’m listing here. What I am going to talk about are the three categories that every strategy falls into. Yes that’s right, they can all condensed down to three overarching types. Weakness early. Teamfighting doesn’t often start before the midgame and is mostly part of the lategame. Teams that focus on this normally have weaknesses in the early game. However, even if they fall behind they are considered a ‘ticking time bomb’ due to scaling. Forcing fights. When you are stronger and your opponent knows it they won’t voluntarily fight you head on: you need to force them to. As such teamfight strategies utilise Dragon, Baron and even Red/Blue buffs to force the opponent into a fight scenario. Chase. This is the area I most often see these strategies fall flat. This is about turning a won fight into an ace. All too often I see teams winning out teamfights perfectly for ~20 minutes of game time but not getting anything from it because the opponent disengages safely with most of their members. Waveclear. This is (arguably) less important and more situational. As mentioned earlier teamfight strategies often are weak early (not always though). In such cases strong waveclear can be all they need to stall out while on the defensive until they scale enough. Objective-focused is the type of strategy that I like to think is MonteCristo’s favourite. It’s all about rotations, siege and splitpushing. The objective-focused team has little interest in fighting the opponent. They much prefer to fight the map, mainly their opponent’s turrets. They either want to poke the enemy until they can’t defend; get to an objective before the enemy or simply pressure elsewhere to allow a splitpusher to do their thing. They will only fight absolutely on their own terms, either with a huge health-advantage (from poking), Baron advantage, or even Aspect of the Dragon. Poke/Siege. This is obvious. Not only does it force the opponent away from an objective but an opponent low from poke won’t want to fight you. Even better if you poke them down enough you will be in a position to start a fight. Disengage. I can’t stress this enough, if you are weaker in teamfights than the opponent (as these teams often are) and you can’t stay out of fights then you will lose. Having disengage let’s you safely go near the enemy team, either to poke them, push them or just whack turrets. Disengage leads to your team having options. Very strong lanes or very safe lanes. Again, going back to “applying safe pressure”. It’s very hard to safely apply pressure from behind. This strategy doesn’t play well from behind and such needs to avoid falling behind early. Mobility. Not only does this let you rotate faster and get to objectives but it also let’s you run away faster when your pesky opponent’s try to engage. This is another reason (beyond his poke) why Jayce fits in these compositions so well: he can speed his whole team up with Acceleration Gate. Tower damage. Obviously the faster you can take down a turret the better. Twisted Fate’s Pick a Card, Ziggs’ Passive, Marksmen such as Tristana and Caitlyn, all are ideal. Worth noting is that longer range results in more turret damage, since short range champions have fewer safe openings. Vision. A team running this strategy relies on vision more than any other, vision allows them to catch an enemy who thinks they are safe out. Even further, they rely on counter-vision; an enemy who can see you can’t be surprised. Strong, hard engage. Champions like Lissandra or Vi who enable you to engage on anyone out of position from a long distance away are important to have. Follow up damage. Whether it’s from a long range (Rumble, Jayce) or can just get to the spot quickly (Ahri, Twisted Fate, Ezreal) you need someone who can finish the kill. Mobility. Mobility enables follow up damage, it let’s you chase down champions out of position. The more mobile your team is the easier it is for your opponent to just accidentally stray out-of-position. Strong early-midgame power spikes. I mentioned this earlier but not why. The simple reason is that picks are at their most effective in early-midgame. Lategame is the realm of the teamfight and trying to get a pick when a team is spending most of it’s time grouped as 5 is difficult. As such it is better to focus your power spikes at a time when picks are easier to get: when turrets are starting to go down, teams are rotating between lanes more and jungles are opening up. That’s all for this week. If you thought all that was simple enough, you’d be right. But in reality it isn’t as simple or neat. My current plan is to write four of these Strategy Workshop articles for you guys, with each one building on the previous one(s). The next week installment will be “Rock, Paper, Scissors”, check back here on Monday for it. If you have any comments, suggestions or questions please feel free to discuss this article.